Your Family May Once Have Been A Different Color : Krulwich Wonders... Skin pigmentation in human lineages has changed faster and more frequently than scientists previously thought, one expert says. A population can be one color, and 100 generations later -- with no intermarriage -- can be a very different color. 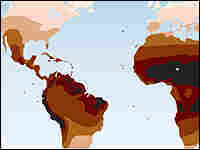 This map shows average skin color across the globe. It was adapted from data published by George Chaplin in the American Journal of Physical Anthropology, Volume 125 in 2004. To begin, please point your elbow to the ceiling. Then look at the patch of skin on the inside of your upper arm, the part of you that almost never sees the sun. Whatever color you see there is what experts call your basic skin color, according to professor Nina Jablonski, head of the Penn State Department of Anthropology. And that color, the one you have now, says Jablonski, is very probably not the color your ancient ancestors had -- even if you think your family has been the same color for a long, long time. Skin has changed color in human lineages much faster than scientists had previously supposed, even without intermarriage, Jablonski says. Recent developments in comparative genomics allow scientists to sample the DNA in modern humans. Because women build babies in their wombs, they need more vitamin D to produce extra calcium for the baby’s bones. Could that explain this difference: When scientists look at the underarm skin of men and women in every color group of humans, the women on average are always lighter than the men. Are the ladies lighter to produce a little extra Vitamin D for the babies? Dr. Nina Jablonski describes the "Under Arm" test. By creating genetic "clocks," scientists can make fairly careful guesses about when particular groups became the color they are today. And with the help of paleontologists and anthropologists, scientists can go further: They can wind the clock back and see what colors these populations were going back tens of thousands of years, says Jablonski. She says that for many families on the planet, if we look back only 100 or 200 generations (that's as few as 2,500 years), "almost all of us were in a different place and we had a different color." Over the last 50,000 years, populations have gone from dark pigmented to lighter skin, and people have also gone the other way, from light skin back to darker skin, she says. "People living now in southern parts of India [and Sri Lanka] are extremely darkly pigmented," Jablonski says. But their great, great ancestors lived much farther north, and when they migrated south, their pigmentation redarkened. "There has probably been a redarkening of several groups of humans." The repigmenting process is increasingly well understood. "Humans started in Africa," Jablonski says, the part of Africa near the equator where it is intensely sunny with lots of ultraviolet light. Ultraviolet light, or UV, in high doses can age the skin and damage the DNA molecule, which makes it harder to build a fetus. Not to mention that ultraviolet light can sometimes cause skin cancer. On the other hand, if a human is plopped down in, say, Norway, where the days can be short and there is precious little ultraviolet light, this creates problems, too. All vertebrate animals need ultraviolet light to help produce vitamin D. Vitamin D helps us absorb calcium from our food to build strong bones. If we don't get enough ultraviolet light, we're less likely to survive to reproductive age to produce strong-boned babies. Thus the dilemma: People who live in sunny climes around the equator have too much UV. People who move away from the equator eventually have too little UV. The solution is what Jablonski calls "a really cool molecule": melanin. 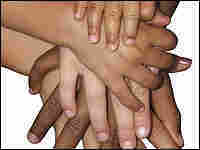 In different concentrations, melanin makes skin lighter or darker. Kind of like a Venetian blind, it can let UV light in or keep it out. Melanin has evolved in many different animals. Humans have had it for a long, long time and what Jablonski and others have learned is that when early humans migrated from the equator, their melanin levels changed. That doesn't mean they lost their tans. It means they had very specific genetic changes that allowed them to live and successfully reproduce in less sunny places. Darwin teaches that these changes began randomly. Somebody in the population at some point had a baby, and that baby, just by chance, had a little change in its DNA that made her skin, for example, a little lighter. When that baby moved north to Europe, lighter skin gave her an advantage as a grown-up, because it helped her produce strong-boned babies who could survive and have babies of their own. Successive mutations created successive generations of lighter and lighter people as they moved north. "This, in short, really created the gradation of skin color that we see in modern humans today," says Jablonski. 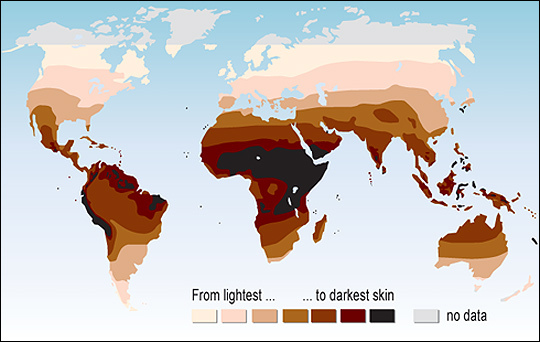 Her map of UV radiation levels on Earth closely mirrors the array of skin colors on Earth. The big surprise is how fast these changes can occur. "Our original estimates were that [skin color changes] occurred perhaps at a more stately pace," Jablonski says. But now they're finding that a population can be one color (light or dark) and 100 generations later -- with no intermarriage -- be a very different color. Figuring 25 years per generation (which is generous, since early humans walked naked through the world -- clothes slow down the rate), that's an astonishingly short interval. It's "a blink of an eye," she says. Jablonski is the author of Skin: A Natural History, published in 2006. These newer findings are mentioned, in a preliminary way, in that book.